The first lunar colonists will grow their own vegetables directly in the soil of the moon, while Earthbound romantics will order moonroses for their sweethearts. Researchers now claim that instead of carting tons of Earth soil to the moon for agriculture, moonfarms will use the dirt, rock and dust already present. The secret to growing plants on the seemingly infertile lunar surface? Just add bacteria. 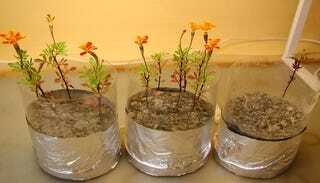 Scientists with the European Space Agency experimented with marigolds grown in crushed anorthosite, an Earth-rock that is a close analogue to the lunar surface. Just potting the flowers in anorthosite was not effective. They didn't grow. But adding certain bacteria made a huge difference. The marigolds didn't exactly flourish in the faux moondirt, but they did grow and even blossomed. The bacteria facilitated the transfer of nutrients from the anorthosite to the plants. Of course, the area where the plants were grown would need to be domed (they still need air) and watered, but they could be part of a water filtration system or even provide food for a self-sustaining lunar colony. While the ESA has no actual plans to go to the moon anytime soon, some scientists think we could send a robot to plant lunar veggies before the first colonists arrive. Photo by: BBC.